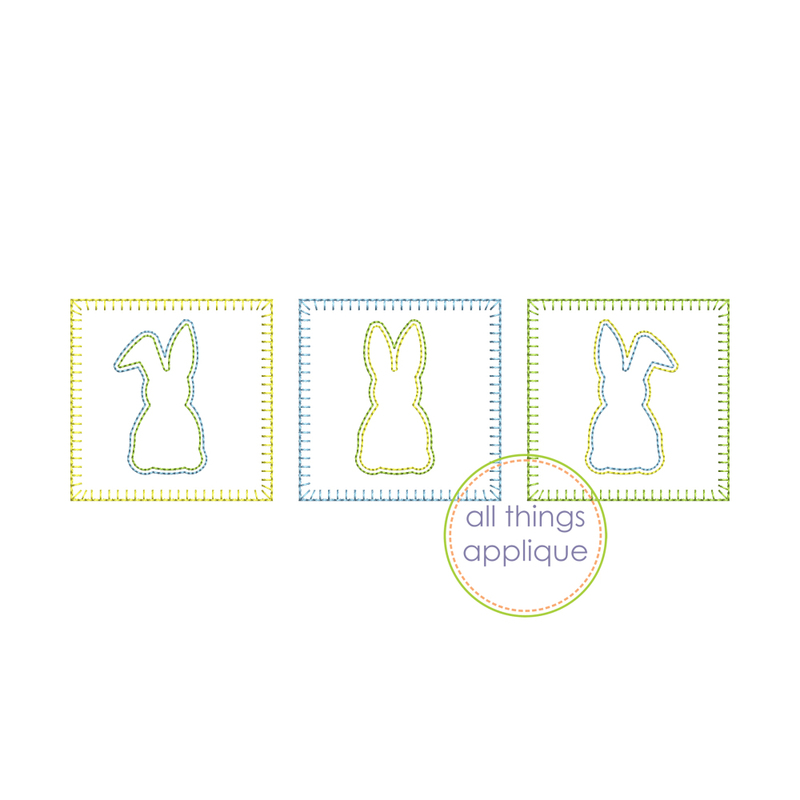 Square Easter Bunny Trio, Blanket Stitch Applique - 3 Sizes! 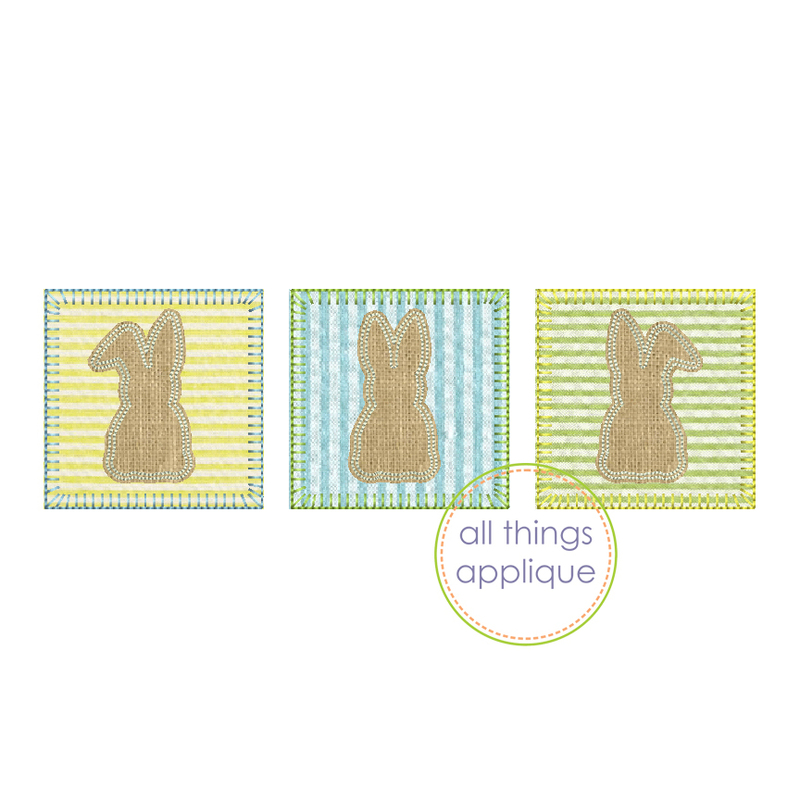 These square patches and bunnies can be stitched with the same fabric for all or a different fabric for each - the choice is up to you! The square patches are finished with a blanket stitch and the bunnies are stitched with a double bean stitch. These square patches and bunnies can be stitched with the same fabric for all or a different fabric for each - the choice is up to you! The square patches are finished with a blanket stitch and the bunnies are stitched with a double bean stitch. Bunny Sitting in Flowers, Bean Stitch Applique - 4 Sizes! Bunny with Balloons, Bean Stitch Applique - 4 Sizes! Bunny with Bow, Zig Zag Applique - 4 Sizes! Bunny with Flowers, Zig Zag Applique - 4 Sizes! Finish Size 2.11" x 6.87"
Finish Size 2.61" x 8.52"
Finish Size 7.40" x 2.28"
This design is exclusive to All Things Applique.